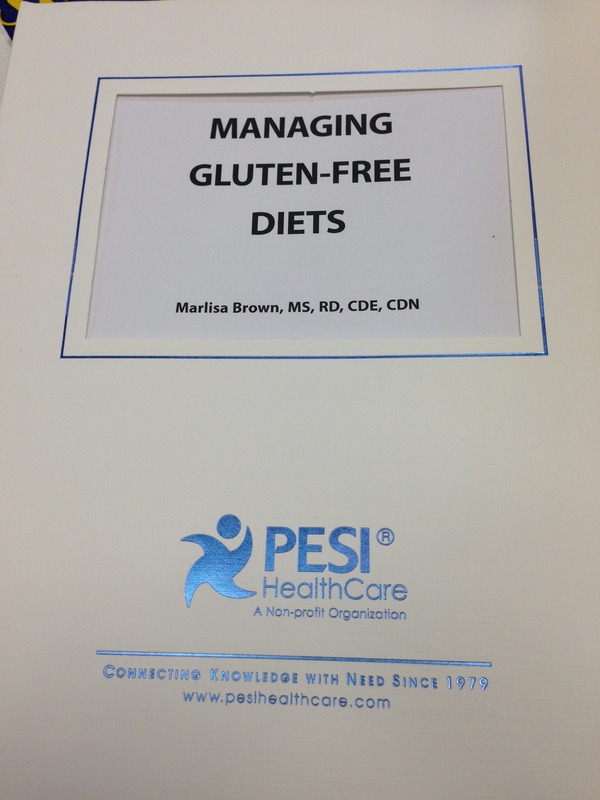 Last week I had the opportunity to attend a “Managing Gluten-Free Diets” conference in Pennsylvania. The conference was a full day event led by Dietitian Marlisa Brown. She is an expert on the topic and provided very helpful information. The gluten free diet has recently become a popular diet trend. Many believe that it can aid in weight loss but there is not scientific research that proves this (gluten free foods are often higher in fat and calories!). It is recommended that you only follow a gluten free diet if you are experiencing symptoms from celiac disease or gluten intolerance. Celiac disease is a disease in which the body is unable to digest gluten, a protein found in wheat, barley and rye products. Gluten intolerance (non-celiac) affects millions of people in the world. Symptoms are similar to that of celiac disease but it does not cause nutritional deficiencies. With gluten intolerance, villi are not affected and therefore malabsorption does not occur. Therefore side effects are not as severe. Many restaurants now have gluten free menus, so don’t be afraid to ask! If you think you may suffer from celiac disease or gluten intolerance speak to your gastroenterologist. They will first give you a blood test to identify whether or not you have genes associated with celiac disease. If you test positive the next step is an endoscopy to confirm a diagnosis. If you do not have the gene you do not have celiac disease but could still have an intolerance. Work with a Registered Dietitian to come up with a meal plan that will suit your needs. Time for a shameless self plug. Georgetown was rated as one of the top 10 Gluten Free Campuses by Udi’s Gluten Free foods!